and all is calm and clear. Joy arises and abides from ineffable awareness of your true nature. Welcome to this web-site. I'm delighted to share with you a hatha yoga method created through divine inspiration called 360 Yoga, where the Soul truly merges in body awareness. As a longtime practitioner of yoga here in the west, I was guided to devote personal practice to a specific style or method that emphasizes conscious awareness of the higher self during the present moment of the asanas: When the Soul meets body. If you're into hatha yoga already, this method was designed to awaken in you the beautiful awareness of your Soul "aware of Itself" consciously while doing the movements or asanas (poses). If new to yoga practice, I'm delighted to provide this web-site which is a creative outlet for me and a powerful portal for you to a whole new way of being. The site was created for students and clients as an extension of my life-work. 360 Yoga is what I call serious spiritual stress management: a spherical matrix for the 21st Century. 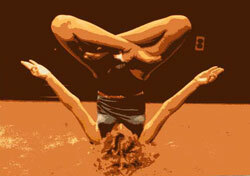 When I began practice more than 35 years ago yoga was on the fringe. Today, let's face it, everyone is interested in this ancient tradition. Why? Well, it works! You do asanas and the "Soul meets body." Even if you're not aware of that fact yet… eventually you will be. Soul is delighted to "feel" Itself through the practice. That's the indescribable joy of being in the moment. The key is conscious awareness of your Soul during the pose -- any posture. As we learn to move consciously...we thin the veil. The veil is generally thinning anyway at this crucial time in our history, but through easy yoga poses of 360 Yoga, the veil or curtain dissapears between our Soul and physical body (vehicle IT has chosen to use during this lifetime). How will you know? When struggle ends. When unbalanced effort ends. When asana dissolves into the pristine light of the present moment, which is clear and calm. Deep profound relaxation is the heart or essence of simple or advanced hatha yoga. Today in our chaotic world we need more and more peace and relaxation. So, a 360 template for difficult or easy yoga poses helps to provide us with a soft structure for silence, for release, for balance in our stressful lives. Without slowing down...without true rest...the veil thickens obscuring our true nature. 360 Yoga, especially through the direct guidance of the conscious awareness of the teacher, is a powerful hatha yoga method to help one realize or "re-member" that their Soul is very much alive within the temple or ITS temporary body. IT "IS" what we are! All is calm and clear... when balance unfolds in the awareness of stillness. into pristine awareness of the present moment. Let's dive deeper in the journey and explore more. Re-member, think outside the box and around a circle--your circle. That's "Doing a 360" (three-sixty). Be truly inspired: Advanced hatha yoga seniors in their 60s-100+!